The Echo Orbiter - "presents... Laughing All The While"
From New Jersey, The Echo Orbiter returns with more of their finely crafted brand of psychedelic pop ditties. Stylistically, this sophomore effort is no different from the band's 1999 debut. But listening to the 12 tracks on this new CD reveals a tighter trio, better and more complex arrangements, and the in-depth studio treatment that was so prominent on the first CD is taken to the next level. Also, while the songs on the first CD struck me as being very much along the lines of the kind of pop-psych that bands like Olivia Tremor Control play, with a nod to XTC, I found the XTC analogies cropping up more often on the new material, as well as a bit of Beach Boys, perhaps due to some of the harmonies. But the bottom line is... these guys can really write songs, and do a primo job of taking the sound and studio spirit of 60's pop-psych into the new millennium while managing to simultaneously induce nostalgia without sounding retro. Songs like "Aqua's Own Pocketwatch Odyssey" reminded me of XTC in their more whimsical moments. "Cooling Down By The Sea" recalls Mummer period XTC, as well as a touch of Beach Boys harmonies. And "Hey Mr. Moonman" and "She Seldomly Joked" are the most purely spaced songs on the disc. But these analogies are simply to give you a frame of reference, clear though the references may be. 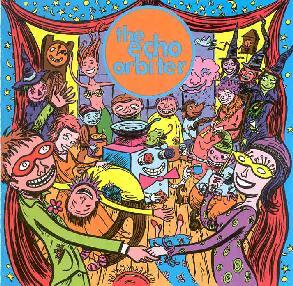 The Echo Orbiter really do sound like themselves and after hearing two CD's by the band now I'm sure I'd recognize them anywhere. Highest recommendation to pop-psych fans. For more information you can visit The Echo Orbiter web site at: http://echoorbiter.homestead.com/echo.html. Contact via snail mail c/o The Echo Orbiter; PO Box 173; Westville, NJ 08093.